Tickets are FREE for Museum members and $10 for nonmembers. Discounted tickets are available for seniors, college students and military personnel (with valid ID) at $7 and youth ages 5-17 at $5. Children 4 and under are free. In addition, TMA will be offering free admission to all on Thursday evenings from 5 p.m. to 9 p.m. To claim your free tickets please see below for details. 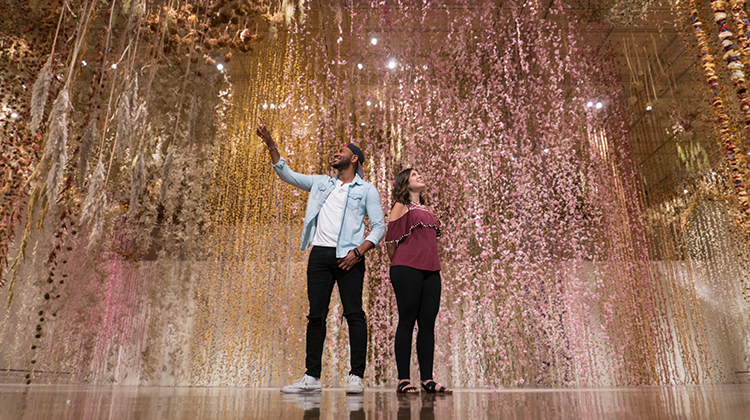 The Toledo Museum of Art is proud to offer free admission to view Rebecca Louise Law: Community on Thursday evenings from 5 p.m. to 9 p.m. Visitors may claim their free timed ticket (one per person) at the information desk upon arrival. Thursday evening tickets will not be available in advance or online. Purchase or reserve your tickets today! British artist Rebecca Louise Law will design and create a site-specific installation using both dried and fresh plant materials to form an immersive visitor experience that explores the relationship between humanity and nature. The artist sources thousands of plants and flowers native to the region for the project, which requires 4,000 volunteer hours of assistance from community members, thematically and literally representing northwest Ohio. A proponent of sustainability, Law also plans to reuse flowers that were previously used in her other installations from around the world. The Rebecca Louise Law: Community exhibition is a site-specific installation using both dried and fresh plant materials. These materials may contain pollen and other allergy-sensitive materials. The Toledo Museum of Art advises each visitor allergic to plants and flowers to be cautious before entering the space. The project at TMA is sponsored by Taylor Cadillac, the Ohio Arts Council and the TMA Ambassadors with additional support from 2018 Exhibition Program Sponsor ProMedica.